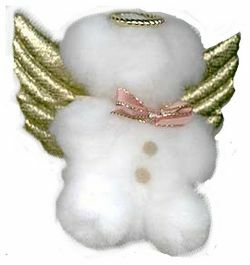 Turn a few pompoms into a teddy bear angel that you can wear as a pin or use as a Christmas tree decoration. Glue the 2 inch pompom and the 1 1/2 inch pompom together (this forms the head and body). Trim away a little fluff from one side of both pompoms. The trimmed area will flatten the bears tummy and face. Glue two 1 inch pompoms for arms, two more for legs and 2 more for ears (refer to the photo for placement). Glue one 1 inch pompom to the back centre bottom of the 2 inch pompom, for a tail (this will help Teddy to sit up on his own). Glue two 1/8 inch pompoms on the tummy (you can use buttons or beads for this instead). Tie a small bow and glue in place on the teddy’s neck. Glue angel wings to the back of the bear and glue a small gold ring to the top of his head. To add a face, simply glue or sew on a couple of beads or buttons for eyes nose and a mouth. You can also add a push pin or broach pin to the back of the teddy and use on your bulletin board or wear the cute little bear. I love teddy bears especially this one and I plan on putting it on my to do list and making it. I want to make one for myself and my friends. I love teddy bears too. I’m sure your friends will love theirs too!